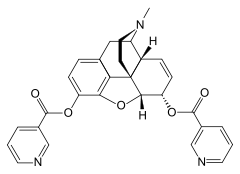 Nicomorphine (Vilan, Subellan, Gevilan, MorZet) is the 3,6-dinicotinate ester of morphine. It is a strong opioid agonist analgesic two to three times as potent as morphine with a side effect profile similar to that of dihydromorphine, morphine, and diamorphine. 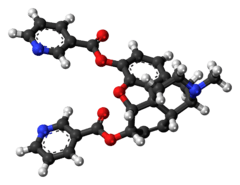 Nicomorphine was patented as Vilan by Lannacher Heilmittel Ges. m.b.H. of Austria in 1957. and was first synthesized in 1904 either there or at another firm in what was then Austria-Hungary. The hydrochloride salt is available as ampoules of 10 mg/ml solution for injection, 5 mg tablets, and 10 mg suppositories. It is possible that other manufacturers distribute 10 mg tablets and other concentrations of injectable nicomorphine in ampoules and multidose vials. It is used, particularly in the German-speaking countries and elsewhere in Central Europe and some other countries in Europe and the former USSR in particular, for post-operative, cancer, chronic non-malignant and other neuropathic pain. It is commonly used in patient-controlled analgesia (PCA) units. The usual starting dose is 5–10 mg given every 3–5 hours. The 3,6-diesters of morphine are drugs with more rapid and complete central nervous system penetration due to increased lipid solubility and other structural considerations. The prototype for this subgroup of semi-synthetic opiates is heroin and the group also includes dipropanoylmorphine, diacetyldihydromorphine, disalicylmorphine and others. Whilst this produces an enhanced "bang" when the drug is administered intravenously, it cannot be distinguished from morphine via other routes, although the different side effect profile, including lower incidence of nausea, is very apparent. Nicomorphine's side effects are similar to those of other opioids and include itching, nausea and respiratory depression. It is considered by doctors to be one of the better analgesics for the comprehensive mitigation of suffering, as opposed to purely clouding the noxious pain stimulus, in the alleviation of chronic pain conditions. Nicomorphine is regulated in much the same fashion as morphine worldwide but is a Schedule I controlled substance in the United States and was never introduced there. Nicomorphine may appear on rare occasions on the European black market and other channels for unsupervised opioid users. It can be produced as part of a mixture of salts and derivatives of morphine by end users by means of treating morphine with nicotinic anhydride or related chemicals in an analogue of the heroin homebake process. Nicomorphine is rapidly metabolized when administered by the I.V. route, having a half-life of 3 minutes, into morphine and 6-nicotinoylmorphine, the secondary active metabolite. Half lives of the metabolites were 3–15 minutes for the nicotinoyl metabolite, and 135–190 minutes for morphine. Via the epidural route, a much slower release from epidural space occurs and nicomorphine remains detectable for 1.5 hours or so, and has a longer effect of 18.2 +/- 10.1 hours due to slower release of the active metabolites, morphine and 6-nicotinoylmorphine. Half lives for those compounds is listed in the IV route. Pharmacokinetics via the rectal route differ, and change metabolism. Eight minutes after administration, morphine appeared rapidly, and had a half life of 1.48 +/- 0.48h. This was in turn metabolized to morphine-3- and morphine-6-glucoranides after another 12 minutes, which had similar half-lives to one-another, at about 2.8h. No 6-mononicotinoylmorphine was found , and bioavailability of morphine and metabolic actives was 88%. No remaining nicomorphine was found in urine. ↑ Vadon P, Rehak P. Comparison of the analgesic effect of nicomorphine in two different solutions (German). Wiener Medizinische Wochenschrift. 1979 Apr 30;129(8):217-20. ↑ Koopman-Kimenai, PM, Vree TB, Booij, LH, Dirksen, R, Nijhuis, GM (Mar 1, 1993). "Pharmacokinetics of intravenously administered nicomorphine and its metabolites in man.". European Journal of Anesthesiology. England. 10 (3): 125–132. PMID 8462537. ↑ Koopman-Kimenai PM, Vree TB, Hasenbos MA, Weber EW, Verweij-Van Wissen CP, Booij LH (Jun 21, 1991). "Pharmacokinetics of nicomorphine and its metabolites in man after epidural administration. (Dutch)". Pharmaceutish Weekblad. Scientific Edition. Netherlands. 13 (3): 142–147. doi:10.1007/bf01981532. PMID 1923705. ↑ Koopman-Kimenai PM, Vree TB, Booij LH, Dirksen R (Dec 2, 1994). "Rectal administration of nicomorphine in patients improves biological availability of morphine and its glucuronide conjugates.". Pharmacy and World Science : PWS. The Hague : KNMP, c1993-. 16 (6): 248–253. ISSN 0928-1231. PMID 7889023.